Congratulations! It must have been amazing to work with Leith Clark, what a dream! So far I've only read the Molly Parkin interview which was fascinating. I had never heard of Nova but now I want to go and find a copy. Can't wait to read the rest of Violet with a big mug of tea. How absolutely marvellous! That certainly is exciting news. 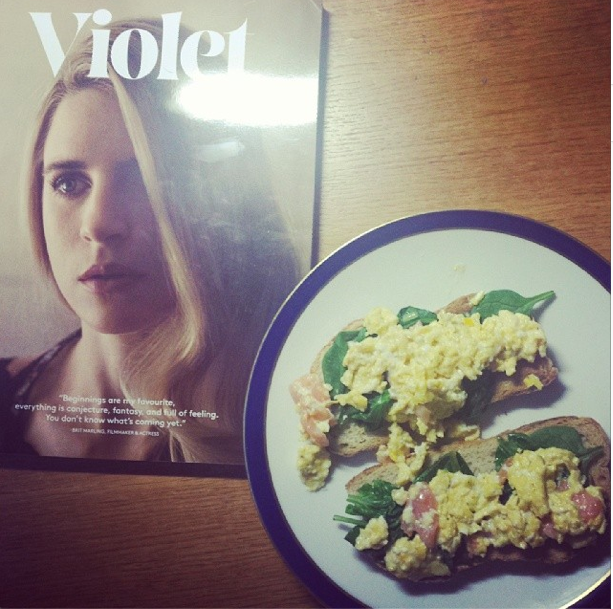 Violet magazine looks wonderful and I will endeavor to get my hands on a copy. That photo of you is stunning, as are all the other portraits seen on the Tumblr link that you provided. The excellent work of all involved resulted in some truly glorious images. PS sorry if this comment (or a similar comment)was already posted by me, computer did a...err...thing. You look lovely on the photograph! How exciting! That photo of you is beautiful and your food looks delicious. Congrats! Very exciting!Your photograph is stunning..and you are a super-talented soul..all the best! Many Congrats! You are amazing. Is it a simple comment? But it is the truth. You in the picture...I cannot describe it in english! But I'll try it: You look out of time. You look young and old. Innocent but mature. Actual but ancient. You look ethereal. Oh wow you look absolutely stunning in that photo!!! Violet sounds like a magazine I would very much want to read, with "aesthetics and intelligent commentary" and feminism. That photo of you is amazing! And congratulations on the magazine, that's super exciting! I'll have to check out that video at some point, it's always so sad when a great talent passes away. How exciting! This a magnificent, timeless photo, as are the other photos which I saw through the link you provided here. I suppose you have created the miraculous 30-hour day to fit in all the wonderful things coming your way. This magazine will take the world by storm, I just know it. EEEP! I am so so proud of you! That image is absolutely stunning and should be framed!! What an exciting launch of what looks to be quite the tantalizing endeavor? Junior editor, you say? I predicted you an editor by 20 so I say KUDOS! Daisies is also available via Hulu Plus- and you've now incited me to get going and give it a watch. You look lovely and congrats on being part of something that looks amazing. Such a fantastic opportunity! It sounds like an exciting magazine and the photo of you is gorgeous as always!